When Moose sees the inviting tree where Squirrel has built his nest, he rubs his itchy antlers against the trunk—and sets in motion a chain of comic catastrophes. The tree falls and wakes Bear, who stumbles into Moose, who causes a truck driver to swerve off the road. But then Squirrel jumps onto that truck and ends up in the city, all alone. Who will help him get home? And how will Squirrel thank them? Kids will love this adorable picture book, with its irresistible animal characters and rhythmic text that’s made for reading out loud. So without further ado…please welcome Cathy Ballou Mealey! I have lived in Massachusetts all my life. I grew up just below the Vermont/New Hampshire border, and went to college in Metrowest. After a decade in Cambridge, I’m currently on the fabulous North Shore. I wrote my first picture book in 2010 to enter the Cheerios “Spoonful of Stories” contest. Even though “Ozzie the Oyster” was definitely not ready for publication, my prize was discovering a passion for the craft of picture book writing. After attending conferences, classes and workshops, I joined SCBWI, the 2012 12X12 Challenge and two critique groups. I have been writing, revising and studying ever since. Drafting TREE took roughly 6 weeks before I had a preliminary version to share with critique partners. I used multiple revision tactics to trim text and tighten the storyline. I plastered sticky notes on my door to rearrange the scene sequence. 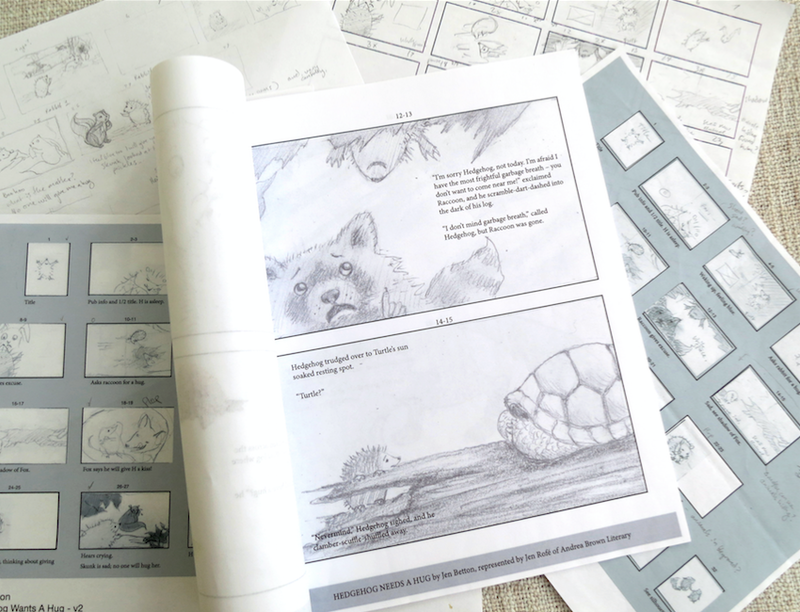 I pasted sentence strips into a book dummy loaded with stick-critter sketches. When friends urged me to send out the revised TREE, I started to query agents. In May 2015 I signed with Liza Fleissig of Liza Royce Agency and by December TREE was putting down roots at Sterling Books for Children. Scribble my idea into a notebook and mull it over. Develop a pitch. Research some related non-fiction titles from the library about moose, squirrels, bears, etc. Mull some more. Write a long, rambling draft. Chew on word choices. Revise, re-write. Plunk text into a word cloud generator like WordItOut or Wordle, draft a few rhyming lines, make a dummy with stick figures. Revise until it is ready for critique group. Mull over feedback. Revise, rinse, and repeat until ready! Go for a long walk outdoors. Visit a museum. Browse the greeting card section of my favorite stationery store. Bring my son to a playground and eavesdrop on the kid chatter! A window. Natural light. Being able to gaze at the sky or trees. I watched a lot of squirrel activity while writing When A Tree Grows, and kept my camera close at hand. Every up-and-coming writer yet to be published inspires me. Making book dreams come true is tough, especially when balancing the demands of career, family life, and community responsibilities. Those who consistently carve out time to nurture that writing spark inspire me to work harder, write better, persevere. I have so little drawing ability that I am floored by almost every illustrator’s work in one fashion or another. Particular favorites to pore over include Catherine Rayner, Hadley Hooper, and Melissa Sweet. I’m so grateful to Kasia Nowowiejska for her dedicated efforts to make WHEN A TREE GROWS the very best book it could be. This is such an interesting question! I can’t name a specific dream project. However, there are certainly manuscripts that I’ve pored blood, sweat and tears into that I would love to see become real, live books one day. Next up for me is a still-secret picture book with an amazing publisher in Canada. A sloth and a squirrel team up for a special mission. Look for an announcement soon, and a book sometime in 2021! An 80’s movie set in 1963 - Dirty Dancing. Huge thank you to Cathy for stopping by Critter Lit today! We are so excited for your debut and can’t wait to see what’s next! CATHY BALLOU MEALEY lives with her family north of Boston, where she delights in watching silly squirrel antics and is waiting patiently for a moose to appear. Her favorite nut is the hazelnut and her favorite cupcake is cardamom crème. Her debut book, WHEN A TREE GROWS, is a rollicking read-aloud that follows a zany chain of events triggered by a broken tree, a cranky Bear, a nut-loving Squirrel and his loyal friend Moose. TO ORDER Cathy’s book, ring up your local bookstore or click here. Want a chance to win a copy of WHEN A TREE GROWS?! Comment on this post or share it on Twitter. One lucky winner will be selected Thursday, April 18th! US addresses only please. What's up on deck? Tune in next week for an interview with debut author Natascha Biebow! Happy Thursday Critters! Today, I’m thrilled to share an interview with Jen Betton, the debut author and illustrator of HEDGEHOG NEEDS A HUG. I met Jen while we were both in school at Syracuse. I was working towards my BFA in Illustration when I took an intro class on Adobe Photoshop and Illustrator, taught by Jen, who was an MFA Illustration student at the time. Adobe Illustrator is actually the only program that I use when I work digitally…which I have Jen to thank for. I’m not sure I would have learned it otherwise. Thanks Jen! I'm so excited to share Jen’s work with you all today, and I’m sure you’ll see why. Her watercolors are GORGEOUS! And she has this tremendous ability capturing light….I’m a huge fan of her work and I hope you will all go out and read HEDGEHOG NEEDS A HUG! So without further ado…please welcome Jen Betton! I recently moved to the Dallas area, so I’m still getting connected with the Kid Lit community here. I always loved picture books; I never really grew out of them. It just took a while to give myself permission to pursue it because I thought I needed to do something more practical! I loved painting and I loved stories, so creating picture books was a natural combination of those loves. Tell us about your debut book as an author and illustrator? HEDGEHOG NEEDS A HUG is the first book I’ve written as well as illustrated! It is about a Hedgehog who feels down in the snout and droopy in the prickles and so goes looking for a hug, but other creatures don’t want to get close to his spines! Fortunately, he finds someone else who is feeling the same way. I came up with this story while I was brainstorming story ideas that involved animals who have a physical characteristic that is at odds with what they want. I love stories where the character has a goal that inherently creates conflict! One thing that helped me figure out my story structure was understanding the heart of the story. This is the essential, core theme of the story, beneath the surface-level action. I was brainstorming the ending and I had to decide how Hedgehog would finally get his hug. Hedgehog could have hugged another hedgehog (someone just like him) or a turtle (someone who would not be hurt) but I had an “aha” moment where I understood that empathy was important to the story, and I quickly realized that Hedgehog needed to give Skunk a hug. If I’m writing the story, then I start with an outline. I really have to get the structure of the story right, and the first draft is almost in bullet points. After that I might start weaving small thumbnail sketches into a storyboard while concurrently revising my manuscript. After I have the basic story arc hammered out, I keep writing, tweaking, polishing. At the same time I’m working on the storyboard with rough sketches, trying to get the composition, the page turns, the expressions right. I try to not to get too far into the drawings until the manuscript is fairly firm, because it’s like working a Rubik’s Cube – every change affects every other part of the puzzle. Next, I start working on finished drawings. For this stage I usually gather a lot of reference materials, sometimes getting friends to pose for photos or taking a trip to the zoo. Then I’ll do some color studies. After all those steps are approved by the art director, I’ll start on the finished paintings. I transfer the drawings to my illustration board, and then I jump in with watercolor. After I’ve taken the painting as far as I can, I’ll often add a bit of colored pencil or pastel for details. Once it is scanned, I’ll touch it up a little bit in Photoshop. Inspiration, community, and perspiration! I get inspired by both books and people. Reading the beautiful books that others have created and seeing how they solved problems teaches me a lot. I find conferences to be energizing - rubbing shoulders with creative pals. My imagination also responds well to discipline, so participating in Storystorm or checking in with critique buddies for some accountability really helps me. And sometimes it’s really helpful to just do something for fun without expectations of how it will turn out. Any art supplies you can't live without? Strathmore 500 Illustration board. Totally different way to watercolor, and I love it! Soooo many!! John Singer Sargent’s watercolors are stunning. I love Trina Schart Hyman, Min Ji Kim, Lizbeth Zwerger, Christian Birmingham, Scott Gustafson, Greg Manchess. A couple newer illustrators I love are Jessica Lanan and Corinna Luyken. Something with a sense of wonder or otherworldliness, like Ocean Meets Sky by the Fan Brothers or The Brilliant Deep by Kate Messner and Matthew Forsythe. What's up next for you? I’ve been working on a new story, called ANITA’S FLOWERS, which is about perseverance, failure, friendship, and finding your gift. Hopefully it will be ready to submit soon! I’ve also been working on some goodies for HEDGEHOG NEEDS A HUG: coloring pages, an activity kit, bookplates, etc. There is also a teacher’s guide by Marcie Colleen. You can download them here. Jen Betton loves to draw and make up stories with her pictures. In Kindergarten she got into trouble for drawing presents on a picture of Santa, and she has been illustrating ever since. She wrote and illustrated HEDGEHOG NEEDS A HUG, published with Penguin-Putnam, and she illustrated TWILIGHT CHANT, written by Holly Thompson, published with Clarion. She has a BA in English, and a BFA and MFA in Illustration. She lives in the Dallas area with her husband and two children. For more information about Jen Betton and her books, visit her online at www.jenbetton.com or follow her on Twitter: @JenBetton. TO ORDER a copy of HEDGEHOG NEEDS A HUG ring up your local bookstore, or click here. Want a chance to win a copy of HEDGEHOG NEEDS A HUG?! Comment on this post or share it on Twitter. One lucky winner will be selected Thursday, September 20th! US addresses only please. I was lucky enough to meet Marcy Campbell a couple years ago at the Buckeye Book Fair in Wooster, Ohio. I was participating as an author/illustrator when Marcy walked up and introduced herself. She told me how she'd just signed with an agent and they'd recently sold her first picture book, ADRIAN SIMCOX DOES NOT HAVE A HORSE. It's funny because at the time, I remember getting a feeling that the book she was describing was going to be special, different, maybe even make a mark. And I was right. It's been wonderful to watch the word spread about this book. It has gained incredible buzz. In addition to Marcy's wonderfully powerful text (I cried the first time I read it), the illustrations are by the extremely talented Corinna Luyken, whose debut picture book last year, THE BOOK OF MISTAKES, was my absolute favorite of the year. Needless to say ADRIAN SIMCOX DOES NOT HAVE A HORSE is a must read! I'm incredibly honored to interview Marcy and thrilled for you all to hear about her stunning, poignant, and extremely relevant debut picture book: ADRIAN SIMCOX DOES NOT HAVE A HORSE. So without further ado....please welcome Marcy Campbell! I’ve always been a writer, since my preschool years when I taped books of my pictures together, but I was never encouraged to pursue it as a “career” and so I did other things first, primarily marketing and public relations. I finally decided to take the leap and got a graduate degree in creative writing. I wrote strictly for adults, however, and after publishing a bunch of short stories, started working on what I’d hoped would be a great literary novel. Then, I became a parent and filled my home with picture books. I think any writer, after spending a lot of time with a certain type of book, will entertain the thought of writing those books. Still, it took me quite awhile to set aside my adult novel projects. I kept a list of picture book ideas and kept adding to it. Then, one rainy afternoon, I was sick and tired of editing my novel, and I opened that idea file and got to work on Adrian. It felt right almost immediately. I won’t say that writing for kids is any easier than for adults (and in many ways, it’s more difficult), but it feels natural, like what I’m supposed to be doing. I have a very different process for picture books versus novels (I just finished drafting a middle grade.) I’m very methodical about novels and have all sorts of steps throughout the phases of outlining, drafting and revising, but so far, my best picture book ideas have come in a moment of inspiration and were written pretty quickly. I think about the idea for awhile and jot down some notes, but then I wait for that moment when I hear the voice in my head and have a sense of the story’s arc. The writing can then happen in a day. After that, I’ll sit on it for a few weeks, revisiting, tweaking individual lines. I’ve found that the picture book drafts that took me a long time to write tend to not work out in the end. Of course writing processes are very different for each writer, and even different for the same writer across different types of books. It can take some experimentation to find what works best. Nothing beats surrounding myself with a stack of new books. When I’m in idea generation mode, I’ll be at the library a lot, and you’ll see towering stacks of picture books on my coffee table. Inevitably, something grabs me and turns me onto a new idea. I also find that long walks in the woods help a great deal (for many maladies, not just a lack of book ideas). I like to clean or paint (walls and furniture, not canvases) or rearrange things in my house, anything that keeps my hands busy while letting my mind wander. When I’m coming up with ideas, I have a spotless house! When I’m finishing a manuscript…not so much. Anything you can't write without? I’m pretty adaptable in terms of location. I write nearly everything on my laptop, so I’m kind of lost without that, though I’ve certainly been known to jot down ideas on scraps of napkin in a pinch. The most important thing to my writing, and general well-being, is a great cup of coffee. Oh gosh, such a hard question. I will say that the picture book that I found most inspirational while writing ADRIAN was Matt de la Pena and Christian Robinson’s Last Stop on Market Street. There are so many fabulous picture book authors and illustrators out there, and, having entered the kidlit world kind of late, I’m discovering new ones every week. Jacqueline Woodson’s books have really touched me. When I want some fun, I love Mac Barnett and Bob Shea and Ame Dyckman (especially her work with Zach O'Hora, whose illustrations I love). Lane Smith is a perennial favorite of mine. I’m certainly partial to Corinna Luyken’s illustrations (and I loved her before she did my book, so I’m only a little bit biased). I’m beyond fortunate to be working with her. The most recent picture book I can’t put down (from both a text and illustration perspective) is Julián Is a Mermaid by Jessica Love. Tell us about your debut book. What inspired you to write it? I did know a boy when I was a kid who said he had a horse, but he said he had a lot of things, and his family seemed to be doing well financially, so there was probably some truth to his boasting. I remember, however, that I thought he was lying about the horse in particular. That childhood memory became one line in a list of picture book ideas I started keeping after having my own kids. “Boy says he has a horse and girl doesn’t believe him.” One rainy afternoon, I was struggling with a rewrite of an adult novel and decided to try my hand at a picture book. Chloe's voice came to me quite clearly, and the story took off from there. Over the last few years, I’ve put in a lot of time volunteering at my kids’ public elementary school, which has a high percentage of children with economic need, and I believe those experiences helped shape the story beyond just a couple of kids arguing about a horse and toward issues of class and empathy. That’s a tough one. Thankfully, my dream book is usually the one I’m working on right now. I do think it would be fun to collaborate on some kind of science series with my husband some day (he’s a biologist). Hands down, Back to Future (the first one; I don’t care much for the sequels). I had a huge crush on Michael J. Fox, and there was a year where my friends and I were listening to all this old 50s and 60s music for some reason. It hit all the right buttons. I still get chills when he’s playing “Earth Angel” at the dance, and his parents kiss, and his hand reappears. Thank you Marcy for chatting with us today! Wishing you heaps of success with your stunning debut and future projects! Marcy Campbell lives in Ohio with her family and menagerie of rescued pets. Her writing for adults has been published widely in journals and magazines, including Salon. She grew up on a farm filled with cows, chickens, cats, and dogs, but she never had a horse. 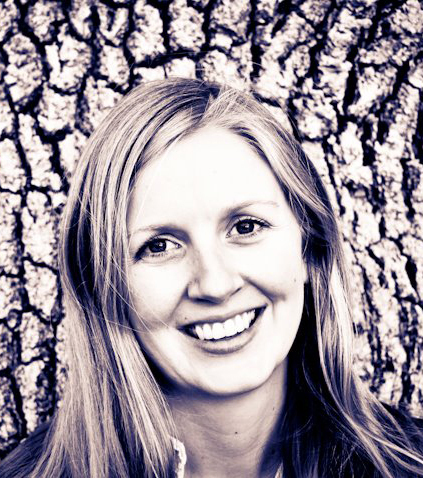 Adrian Simcox Does NOT Have a Horse is her debut picture book. For more information about Marcy Campbell and her books, visit her online at www.marcycampbell.com or follow her on Twitter @marcycampbell. TO PURCHASE A COPY of ADRIAN SIMCOX DOES NOT HAVE A HORSE visit your local bookstore, or click here. Want a chance to win a copy of ADRIAN SIMCOX DOES NOT HAVE A HORSE?! Comment on this post or share it on Twitter. One lucky winner will be selected Thursday, August 23rd! US addresses only please. What's up on deck? Tune in next week for an interview with author + illustrator Betsy Snyder! The beginning of making a picture book. Lots of staring at a wall filled with drawings. This was the first color sample I did for Brobarians. The tiniest Brobarian you've ever seen! Illustrating my own dog Sally into the book. Seen here with her own Brobarian. In order to make the Map of Brobaria endpapers look like it was actually drawn by a kid, I drew it left-handed. It was much harder than I thought it would be. The red squares = complete. This is how I kept track of which spreads I had finished as I typically don’t work chronologically. The aftermath of a picture book. I’m usually finding bits of paper from a book months after I’ve finished it. The paper gets EVERYWHERE! Not to worry, even thought I finished the book, I still have my own little Brobarian who keeps me on my toes. I think I was a little gung-ho on this one. We ultimately didn't go with this option because we didn't want to give away the fantasy scenes included in the interior of the book. This is where the reader sees how the brothers actually see themselves in their imagination. Although this really conveyed the action and energy of the story through the movement of the brothers running, we wanted readers to connect with the characters, which is tough through a profile image. Now we were getting somewhere. We could see the brother's environment, we had a head on perspective to connect with them. But, by closing Iggy's eyes, the reader loses the connection with him. So this cover option didn't make it either. I tried a variation on Cover Sketch 3 by doing more of a close-up on the brothers. Obviously Iggy's eyes closed was still an issue, but I wanted to see if a close-up would make a difference. Ultimately, we felt that we understood the context better if we could see more of the background and the objects they were holding on to. Again, super gung-ho. I loved the idea of this cover, but it would have given away too much. And this spread in the book is one of my favorites. Having gone this way for the cover would have taken away from the climax of their battle scene. While I was sketching all of the cover options, this was one of my favorites. But after some back and forth over it with the team at Two Lions, we decided the attitude the boys had was a little too much and didn't really reflect the feel of the book. This is how the art looks when I send it to my editor and art director for approval. Everything is taped down so that I can still make changes. I had run out of drafting tape at this point and all I had left was floral wasabi tape, thus the patterned tape everywhere. I don't glue anything down until the very end. Then the book designer goes in and lays out all the copy on the flaps and spine of the book. We went through a few changes with this until we settled on the perfect one. I'm thrilled with how it all came together. I worked with an amazing team of people at Two Lions. So all that for one cover - no big deal right? I hope you enjoy Brobarians as much as I do. For more information about the book or to pre-order Brobarians, click here. At the end of this month, my newest picture book BROBARIANS with Two Lions, an imprint of Amazon Publishing, will pub on March 28th. I'm so excited to share this book with all of you for many reasons, but mostly because I never thought this book would be published. I honestly didn't think anyone would get it. It's weird and quirky and has nods to the writing of John Milius, who isn't exactly the poster boy for childhood. Yet here we are, a month out from publication thanks to all the fabulous people at Two Lions who believed in it too. Let me start from the beginning. My husband has this list of must-see movies. He's very particular about them and feels that they are necessary to be a well-rounded viewer/human being. In other words, if you haven't seen them, he won't think much of your movie taste. What can I say, he's particular about his movies. One of the movies on his list is Conan the Barbarian, written and directed by John Milius, starring Arnold Schwarzenegger. I know what you're thinking. Really, that's on the list? Yes. And like all of you, I thought could this movie really be worth two hours of my life? But my husband insisted. Apparently my life would be stunted without it this viewing experience. So we watched it. And to be honest, I hated the first half hour of it. It was campy, cheesy, and completely ridiculous. But then something strange happened, I started to enjoy the campy, cheesy, and completely ridiculous dialogue. It was so over the top. This movie represented everything I would typically pass on, but for some reason it all worked. By the end of the two hours I loved it. And better yet...and book idea was forming. I realized that the voice of Conan the Barbarian is what really sets it apart. I don't mean Arnold's voice, but rather the words of John Milius, the writer. This is the same guy who wrote Red Dawn, Apocalypse Now, Dirty Harry, etc. An over the top, larger than life writer and director in the movie business. In fact, if any of you have seen The Big Lebowski (another movie on my husband's list) the character played by John Goodman is based on Milius. I imagine you have to be pretty bold to create his resume. Days after watching Conan, the voice stayed with me. And then I remembered a story my husband told me about he and his brother when they were little. My husband is two years older than his younger brother. By the time his younger brother was walking around with a bottle, my husband had already been weened off of them. But that didn't change the fact that he still wanted one all the time. So on occasion my husband was known to steal his younger brother's bottle and go hide behind a chair while he gulped it down. This lasted a whole of five minutes before their mom would figure out what had happened and take the bottle away. Apparently this became a household routine. So between the Conan voice bouncing around in my head and the story my husband told me...BROBARIANS was created. As soon as the idea popped into my head, I wrote the first draft in one go. The story went through many, many, many drafts and revisions. But finally I was ready to create a dummy and send it to my agent. She must have thought I was crazy the first time she read BROBARIANS. I knew it was going to be a tough sell because the voice was so adult. But I also knew that's where the humor was. This idea of babies juxtaposed with this over-the-top narration was too funny not to try. We went out on two rounds of general submission and magically two houses were interested! I couldn't believe someone was going to let me publish this book. Even now I still feel that way. Ultimately we felt that Two Lions and Amazon were a great fit for BROBARIANS. "I can say with certainty that this is the only time I have ever said this to anyone: thanks for watching Conan the Barbarian." So...here's the point of this post: you never know where your ideas will come from, least of all a movie night with your husband starring Arnold Schwarzenegger. Who'd of thought? I'm thrilled to share BROBARIANS on March 28th! I hope you all find it as funny as I do! To pre-order BROBARIANS, please click here. Make sure to check back during the month of March for more posts about the making of BROBARIANS!